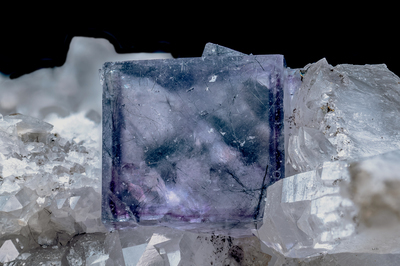 A purple and blue fluorite crystal, which incorporates needles and boulangerite rings (if you enlarge the photo you will find 5). On white quartz crystals. Collection and photo of Gianfranco Ciccolini. Nikon D750, bellows, Scheider Kreuznach Componon 80 mm; f: 5.6. Focal using 7.